The Cajas National Park is a wonderful high páramo, a glorious mountain world of rock domes and peaks, pristine Polylepis and high montane forests, beautiful lakes, high waterfalls, creeks that teem with trout and ancient Inca roads which connected the pre-Colombian imperial city of Tomebamba with the coastal region. 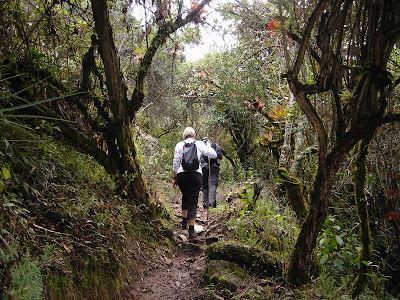 This trek can be combined with a visit of the nice colonial Cuenca and the imposing Inca ruins of Ingapirca. Another possibility is to combine this 2 day trek with the 4-day Inca Trail from Achupallas to Ingapirca. Walking hours: 1 st day 3 and 2 nd day 7. Fixed campsite at 3900m. Pack animals are not necessary.